I thought I’d start this blog by posting one of my favorite photographic moments. We as photographers spend so much time trying to make everything come together in a photograph–the light, the composition, the appropriate aperture and shutter speed settings, the content and visual story-telling elements. So often, despite extraordinary patience, things just don’t work as we wish they would. Every now and then, however, everything comes together and it almost feels miraculous. This was what happened on a hot humid morning in Fumba, Zanzibar. I was working on a story about a shellfishing program run by the Woods Hold Oceanographic Institute that teaches Zanzibar women how to cultivate shellfish as an alternative form of protein and income source. I was hoping to meet my subject, Ikiwa Abdulla, very early in the morning to get the early morning light. I was told that the women only started shellfishing at around 8am. That night I had stayed in a house without running water or power. I had one bucket of water for a couple of day’s stay and only one morning to shoot the women shellfishing. I really needed to make some good photos despite what I knew might be bad light conditions. At 8:30am Ikiwa still hadn’t shown up. The sun was rising quickly and already the beach looked too contrasty to make good photos. Half an hour later, I noticed the sky was getting really dramatic. A storm seemed to be gathering off in the distance. Soon after a rainbow appeared and the light became suddenly extraordinary. It was so beautiful and I desperately wanted to shoot the scene with some human element, preferably my subject. Out of the blue, a woman appeared and started walking at a determined pace out to sea. She ignored me completely which I was thrilled at. I knew the rainbow could disappear at any moment and wanted to capture her walking past without her being conscious of me or the camera. 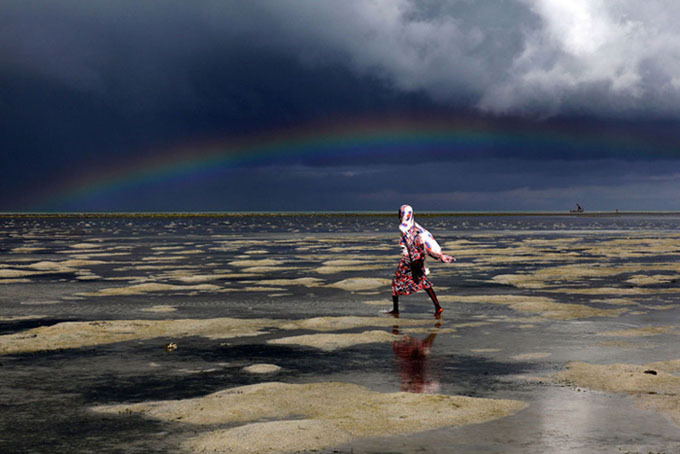 I literally was able to make a few images before the rainbow disappeared and the woman, who, to my joy, turned out to be Ikiwa, was too far away. Without even looking down at the back of my camera, I know something magical had happened. I see the photo, which I love, as a perfect metaphor for the story I was working on as well as a wonderful reminder to always be ready for the sublime moment to happen even when one least expects it. How beautiful…your words are almost as picaresque as the picture!